On the second tuesday of even numbered months, pet dental company, inc. comes to our salon and provides non-anesthesia teeth cleaning for dogs and cats. 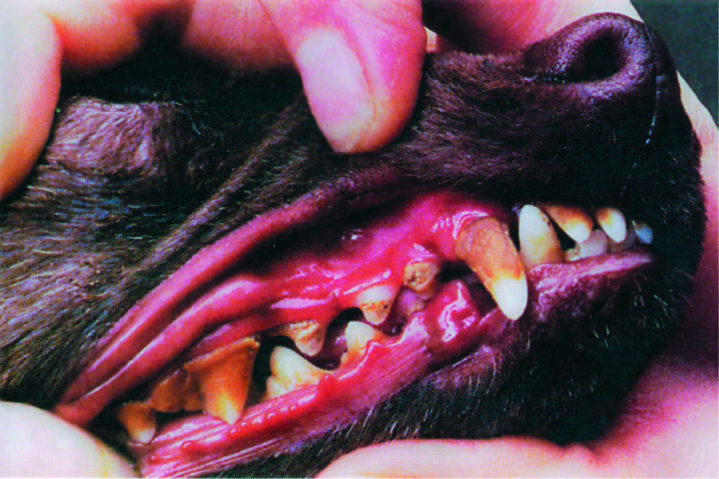 This is an ideal option for animals that just need the tartar removed from their teeth and for geriatric dogs where anesthesia can be a safety concern. No drugs are used on your pet. The pet sits in the lap of the vet. tech., wrapped in a towel while their teeth are cleaned. the process takes less than 30 minutes. the majority of animals are great candidates for this less invasive cleaning process and only in the case of severe stress or aggression would the vet be unable to complete the service. In the rare instance that occurs, there is no charge for the service. Why not do your pet and yourself a favor and get rid of that bad doggy breath. See the before and after picture below! !